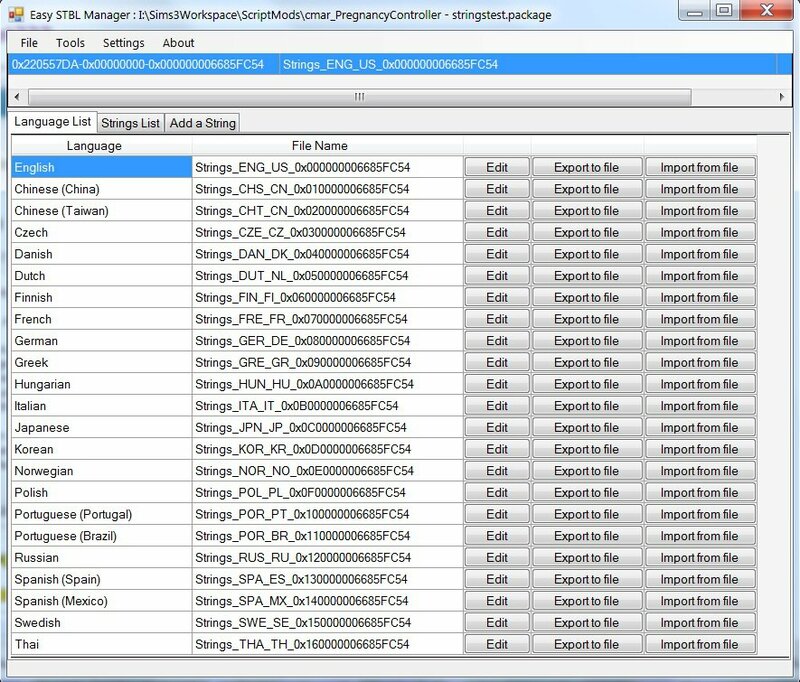 This is a tool primarily for script and object modders to make it easier to manage the STBL files that provide translations. It can also be used by mod users to make translations for their own personal use, and by creators/users to provide an easy way to contribute translations for a mod and load them into the mod package. This needs more extensive testing, so please be a little careful when using it - make a backup of your package first and/or save it as a new package. Please report any problems. Reasonable suggestions for enhancements are welcome. Runs on Windows using .NET 3.5. May run on Mac and Linux using Wine or Mono. Unzip the files to a folder, and run EasySTBLmanager.exe. Peter and Inge Jones for the s3pi library which saved me a load of time and effort, and for answering my still-can't-wrap-my-head-around-interfaces questions. Twallan for the idea of importing translations in xml.